with real history of age & use in their condition this cannot be replicated. 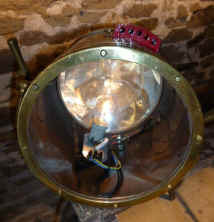 098 Above Francis FB 11 inch halogen fitting 230 volt as arrived. 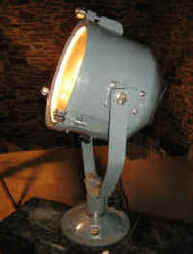 044 Six pics Below Francis Marine 250 mm Royal Navy Warship signal / searchlight. Dated 1988. 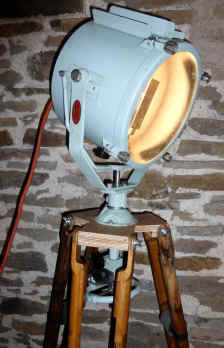 Weight 33 kgs without brass pedestal & Solid Beech block base with none marking castors . 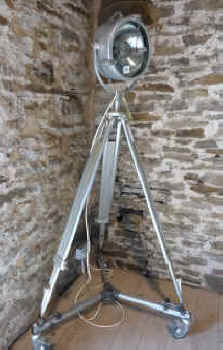 Mounted on very strong French "Gitzo" polished Alloy tripod fully extended 12 ft ! 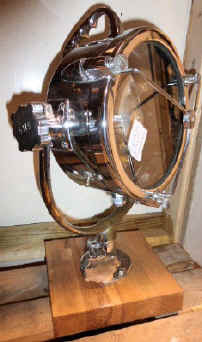 triple stage legs, rubber feet with anti splay that can also be set as low as 2ft.6 inch. 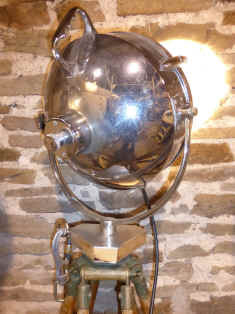 142 Below 2 pics left Francis 9 inch SB 1964 chrome on brass 240 volt Edison E27 Crown top silver bulb. 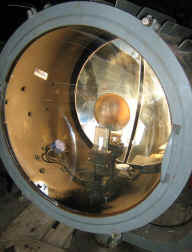 Also E27 12 volt bulbs available to use as a tunnel light. 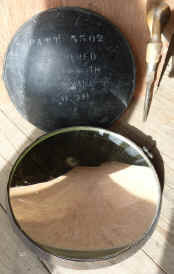 Original alloy mirror. New cable with earth . 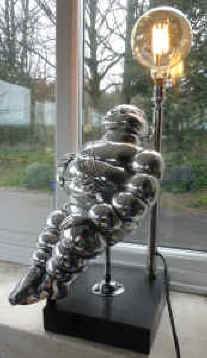 168 Below right BIBENDUM approx 16 inch Michelin man cast synthetic model, signs of age. 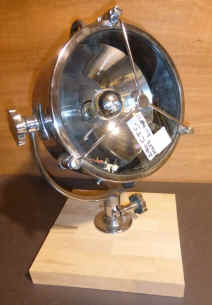 can be any ES bulb 12 Volt Pearl also available or 240 volt Crown top silver, new cable & gland with earth . 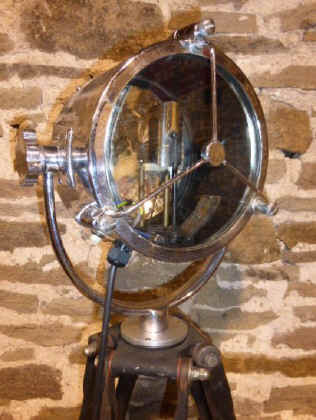 Great feature light £1675 I can include a dimmer socket. 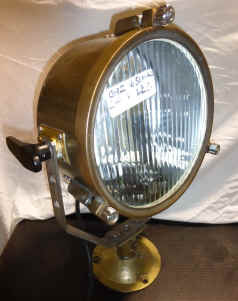 Including LED, Pearl 12 Volt & 240 Volt. 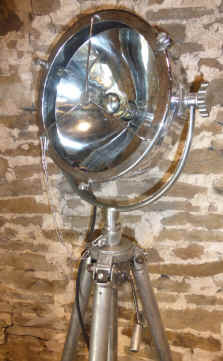 Fantastic bright working or feature light. 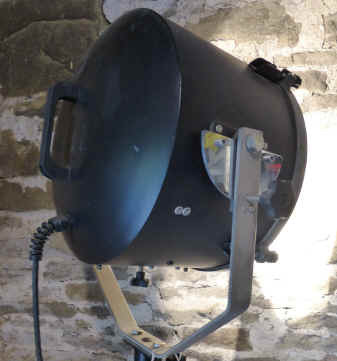 Can be converted to Ceiling / Hanging, bare in mind weight. 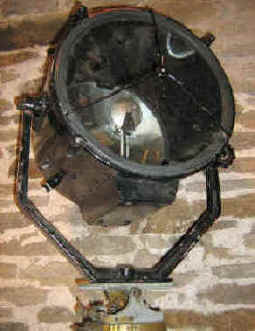 003 Above right two Francis brass 11 inch searchlight. 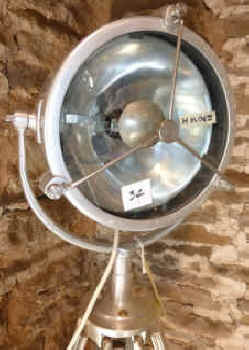 domestic display feature light £1575. 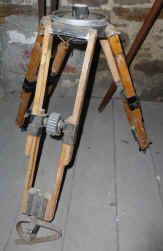 I will include the modern "Glide gear" dolly for easy movement. 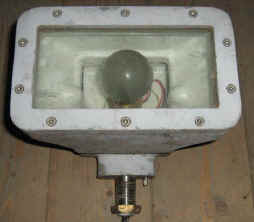 with earth for all voltage. 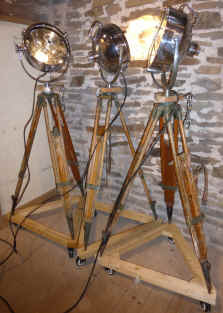 Can be sold as as set of four, Or split £2200 OFFERS Set of four with base mounts. 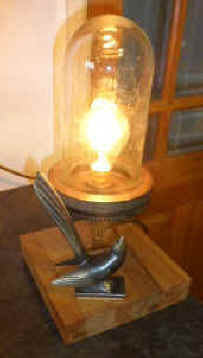 for desk / table or UP lighting including stainless steel coach bolts. 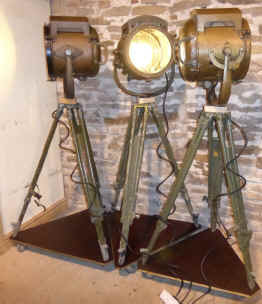 140 Below Matching set of Francis SB13 inch Ex MOD Searchlights. 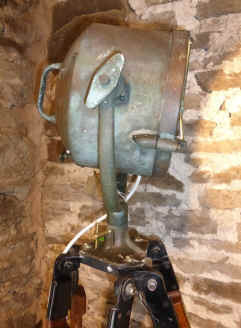 All have Beech & alloy spigot adapters with karabiners for wall tethering. 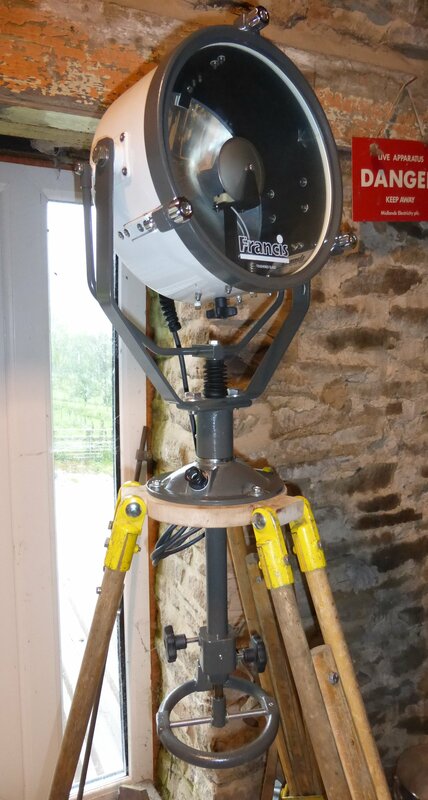 Mounted on a "Kern Aarau" matching satin all alloy extending tripod including alloy Dolly. 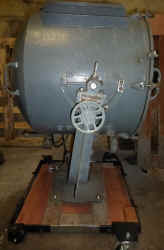 132 Above right Rare 1948 Francis cabin operation 9" some more restoration to sort out. 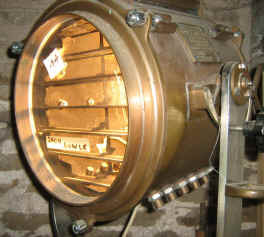 Twin brass data plates Francis & "Simpson and Lawrence" Arrived as a box of parts still has it's 12 volt bulb. 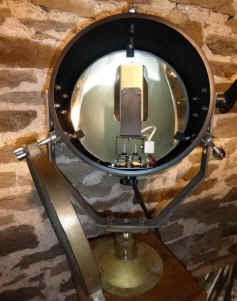 Perfect original mirror mounted on a ex Military hard wood & brass tripod. 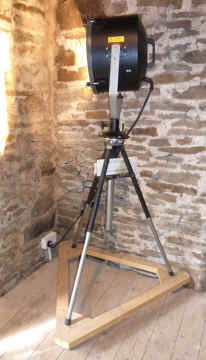 Sell without tripod for £ 425. 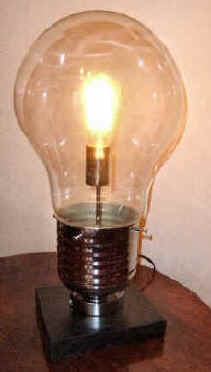 165 Above far right Giant alloy ES bulb on ebonised wood Vinyl backed none marking base. 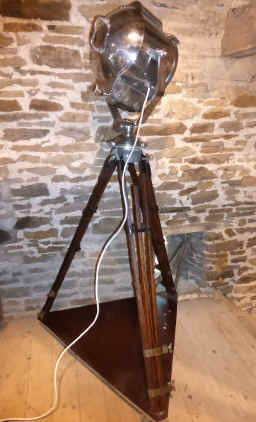 Mounted on a very rare & heavy WW1 film era tripod approx 10ft fully extended! about 7ft in picture. 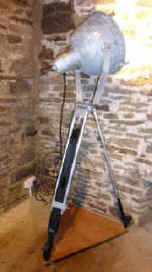 £1550 I would sell light without tripod. 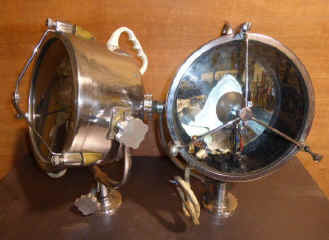 original electrics and cable. 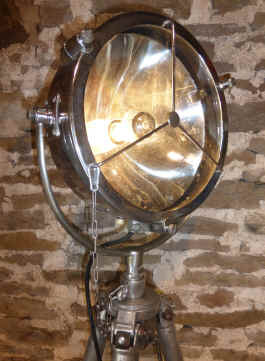 Natural patina. 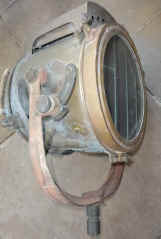 Remanufactured brass tilt handle. 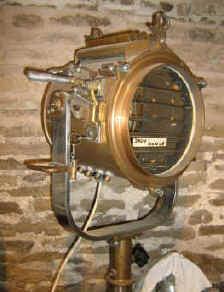 12 inch across lens 14inch depth max. 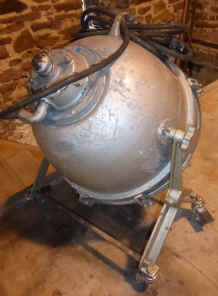 Remnants of original Air Force blue paint. 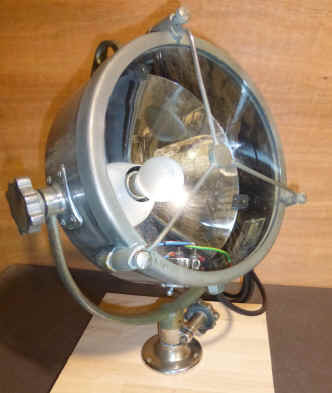 They were originally carbon Ark lights converted to bulbs many years ago. 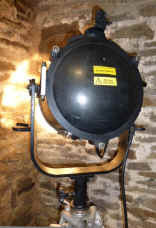 Mounted on matching Ex Military tripods in original cast condition. 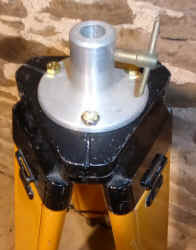 Beech & alloy spigot adapters with karabiners for wall tethering. 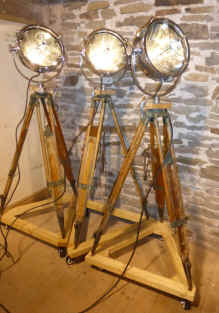 Let me know if you have any info on the manufactures. Could be polished but not by me. 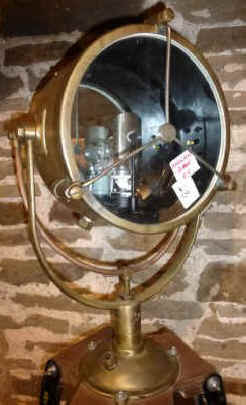 complete with cabin internal base & deck handle, nice brass patina. 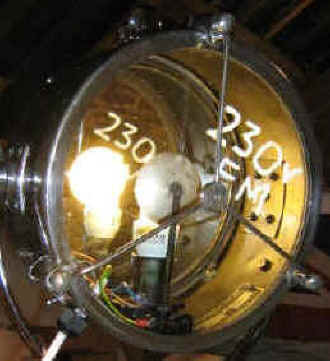 240 Volt ES touchable E27 halogen bulb. 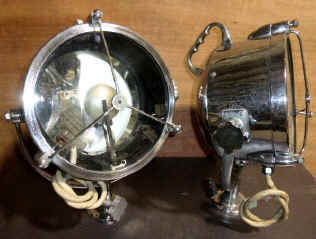 LED & 12 Volt available. 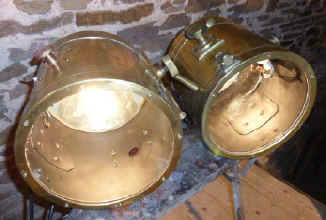 129 Above A pair of Francis Ex Fire Service with matching original patina & character issues ! 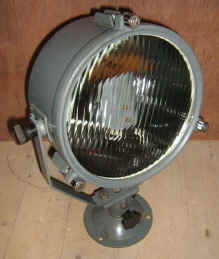 041 Below left light grey Francis BIG 300mm 240volt 650 watt. 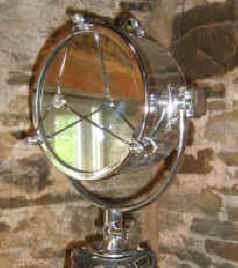 Glass parabolic mirror, Original paint over brass, alloy and stainless steel fittings. 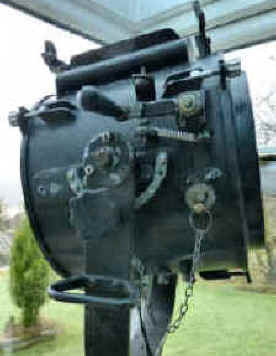 105 Above 3rd right Francis FR 280 mm Cabin/cab operation. 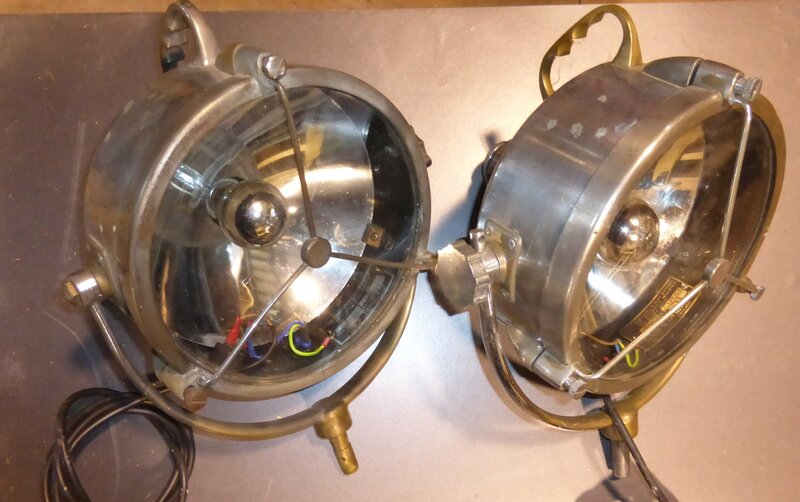 NOS can be 12/24/230 volt Halogen or 12 volt LED. 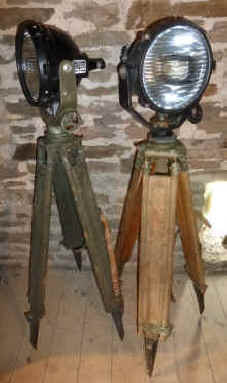 Note :- Modified tripods for Cabin operated lights just for moving & display use not included. 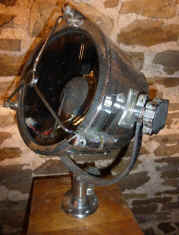 (1000 watt available) with adjustable focus. 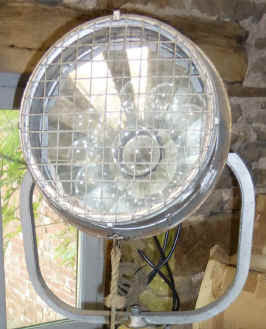 I will include a GES to ES E27 converter to fit lower Watt Halogen bulbs or LED Corn bulbs. 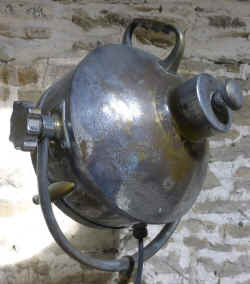 Galvanised barrel with brass fittings. Could be painted to suite new use. 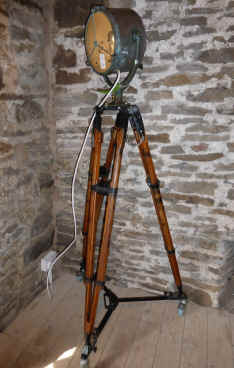 Mounted on a Sokkia wood & alloy tripod (included) standing at 6 ft in picture. 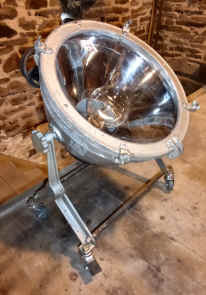 Perfect alloy reflector. 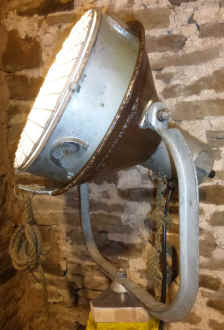 Light is New Old Stock condition. 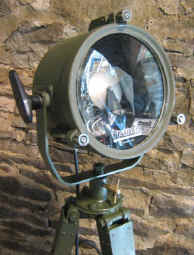 068 Above EX Military Field encampment Floodlights ( I have 2 left ) Segmented "petal" glass mirror reflectors simple and inexpensive to replace with front lens protectors. Re wired Can be110 or 230 volt. 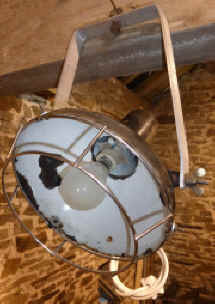 At the moment new 300 watt bulb GES fitting. 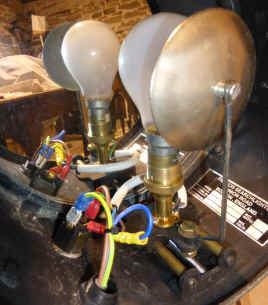 I can include GES to ES E27 converters to fit normal domestic bulbs. 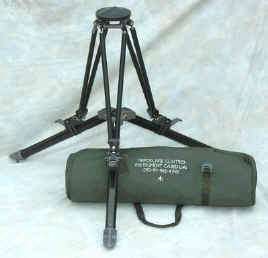 (Tripods available extra). 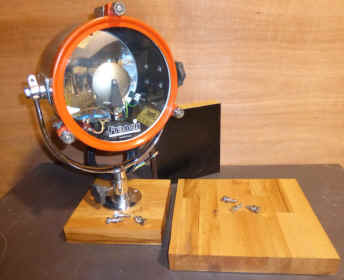 (Beech blocks for floor "UP" lighters with base mounts at extra cost) Ideal Diorama or art work display .Could also be hung as ceiling down lights, I have ring bolts or Karabiners for hanging / Pendant, shown with cradle spigots. 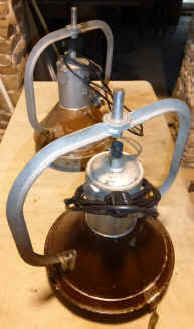 Original 5 ft long rope adjusters with wood toggles ideal for ceiling adjustment. Roached areas are lacquered could be over spayed colour of choice. 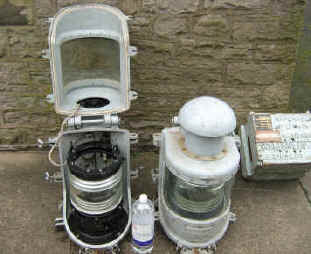 (see pic left) D12 fitting 240 Volt matched pair. 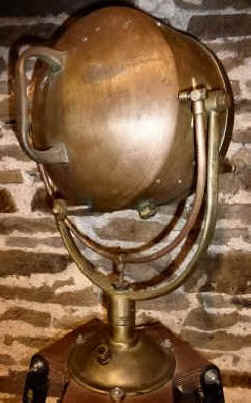 Antique brass finish. 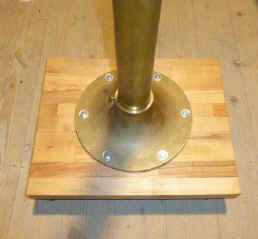 Brass barrel & cast brass base mounts. 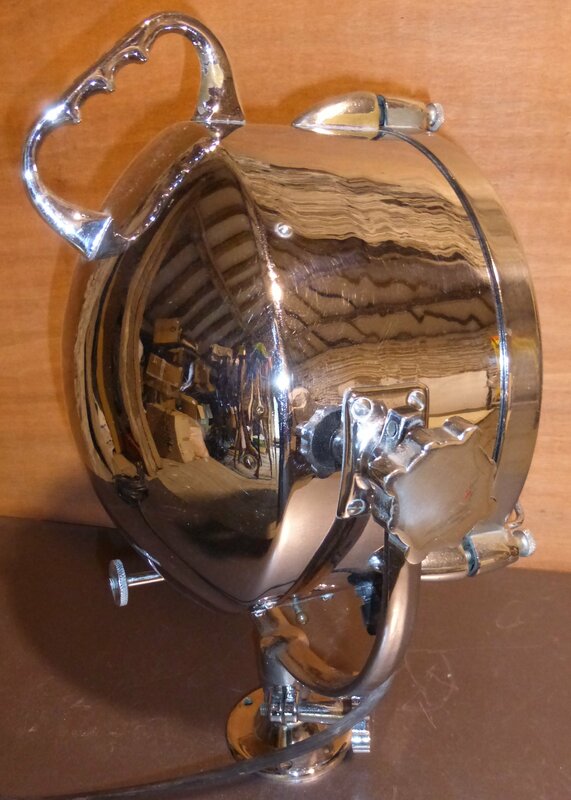 Stainless steel cradles & Base mount Allan cap head locking bolt. 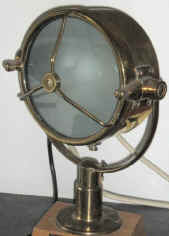 Front lens can be changed for clear or etched glass. 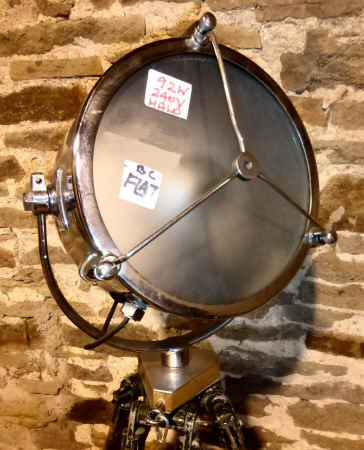 141 Below Francis FB 11 inch chrome on brass. 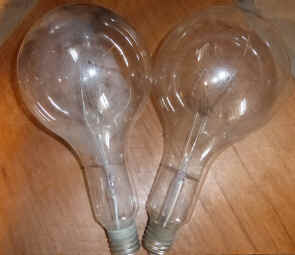 BC 240 volt 100 watt pearl bulb. Frosted lens. 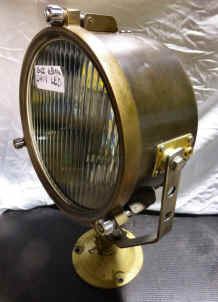 155 Below Francis SB 11 inch 1969 brass searchlight. 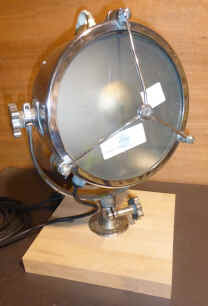 Alloy Parabolic mirror. 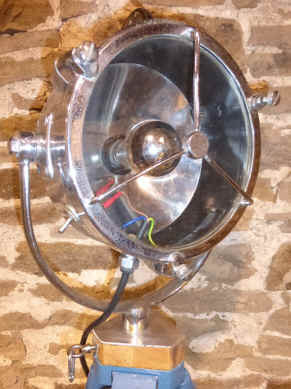 Fitted 240 volt ES Crown top silver bulb, LED E27 Corn bulb available .Earthed cable with Crabtree switch. 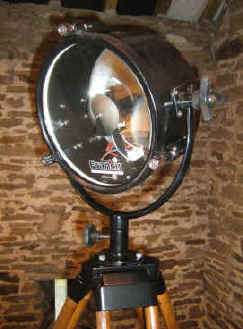 Note:- Above dolly's just for display use could be included. rubber feet ,Mounted on a Belora heavy duty soft wheel dolly . 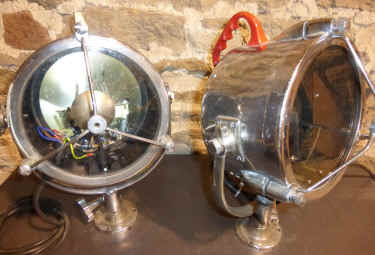 I could swap for flat display, Halogen bulb fittings. 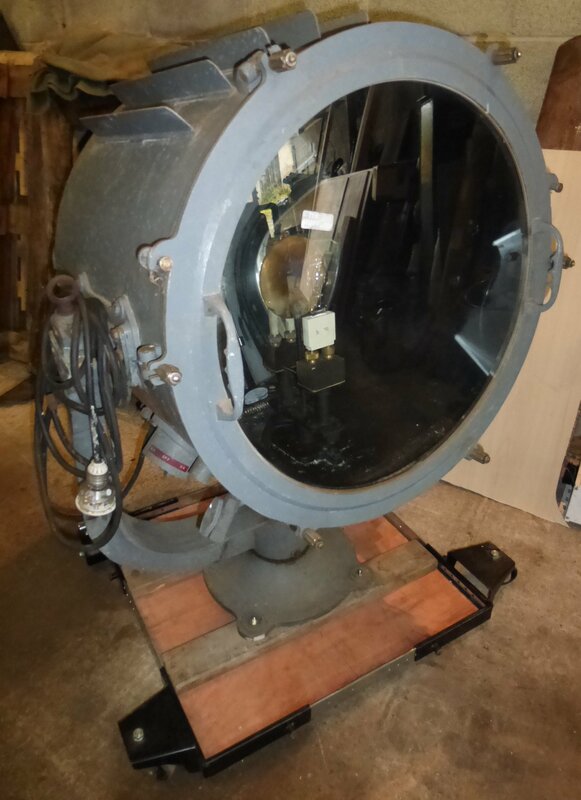 and pan ( legs set at lowest position in picture ) Both complete original un restored condition can be sold "as is"
162 Above Right Francis Marine M15 9 inch cabin operation. 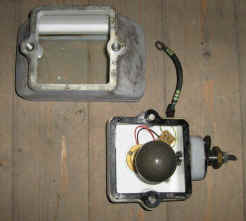 2 core cable Halogen GY6 12 / 24 Volt. 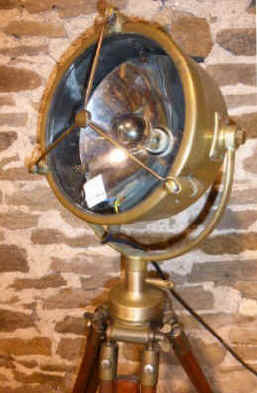 066 Above left & middle Francis Marine 11 inch Brass searchlight Edison screw E27 230 volt 60 watt bulb. 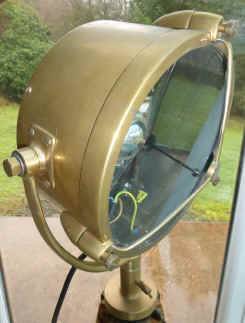 008 Above left and middle Francis FB 9 inch searchlight chrome on brass 230 volt Halogen bulb. 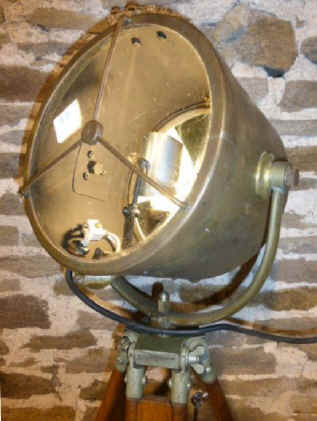 118 Above Francis FB 11inch Searchlight BC 230 Volt low energy bulb, flat mirror, Crabtree switch . 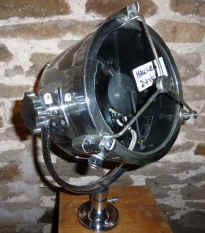 114 Above left Francis FB 9 inch Halogen two pin 12 / 24 / 240 volt . 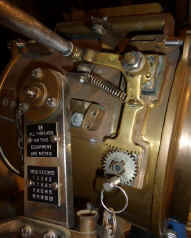 No switch, Rear handle. 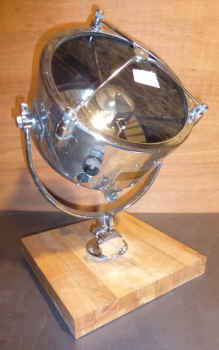 Original perfect glass parabolic mirror. Boat or vehicle. 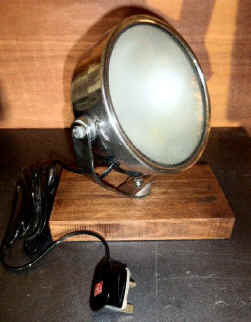 chrome "pimples" Vehicle / Boat light. 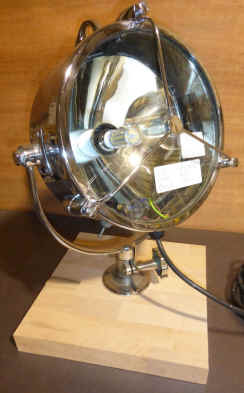 can be 12 ,24,or 230 volt GY 6 halogen bulb, 12 volt LED. Some minor signs of service. 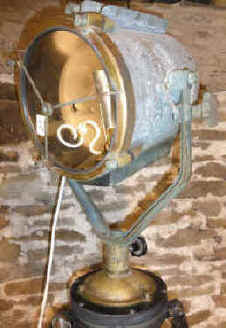 Original heavy cast brass base mount £475. 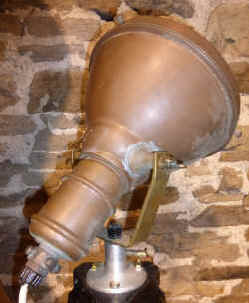 Less without base mount. 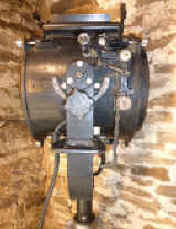 110 or 230 volt. 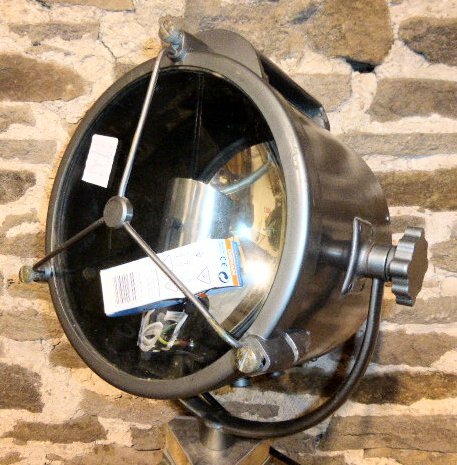 GES to ES Conversion included for larger range of bulbs including LED or 12 volt. 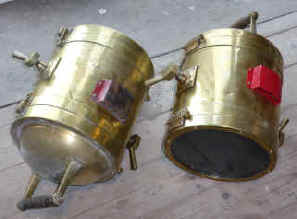 Alloy cradle & Steel barrel with brass fittings. 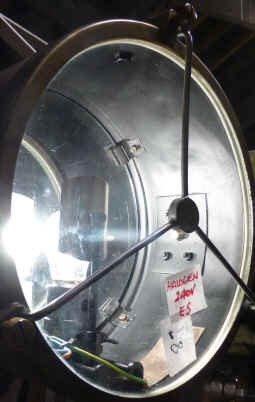 spun alloy reflector. 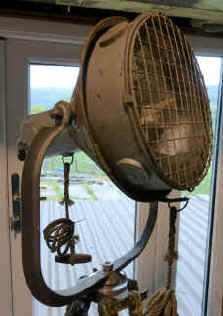 Original cable. 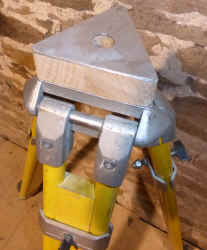 Fitted 50mm braked none marking soft rubber castors. 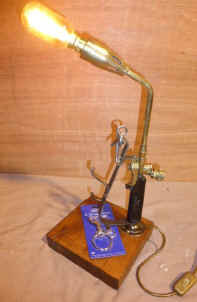 Ideal for art work display or diorama UP lighter. 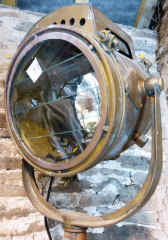 for a wider range of bulbs including LED. 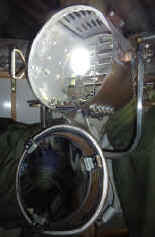 and Cradles Ex Chieftain Tank lights both mounted on EX MOD tripods. 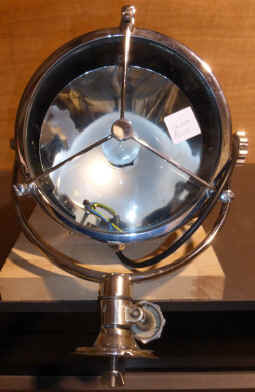 240 volt 600 watt .Stainless steel body toughened glass lens. Fixed focus inc new bulb. NOS. 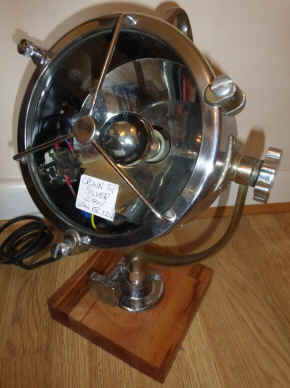 £475 just light. 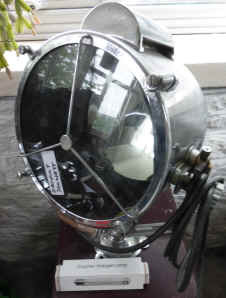 £2500. 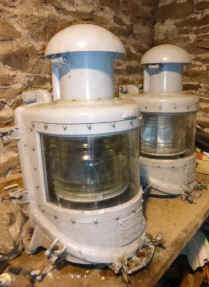 The ship now dismantled . 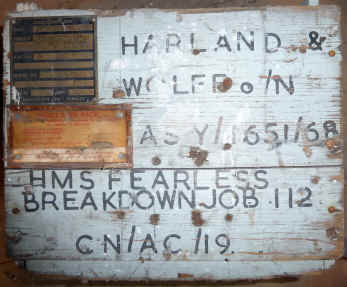 Picture above middle is a spare extractor fan motor in the original box with Fearless data plate history. 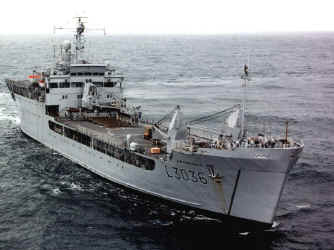 036 Above 1982 Falklands and 1990 first Gulf war veteran HMS FEARLESS. Built by Harland & Wolf 1965. 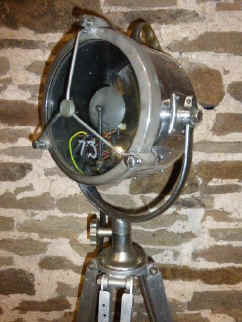 Daylight signal lights, large 28" tall & very heavy All alloy totally original, inc all data plates, Dated 1961 made by Francis searchlights. Unique ? 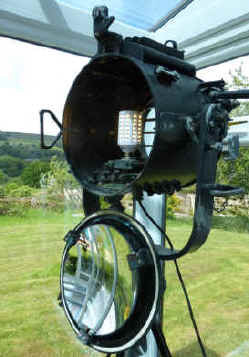 Fantastic outside / inside feature lights. 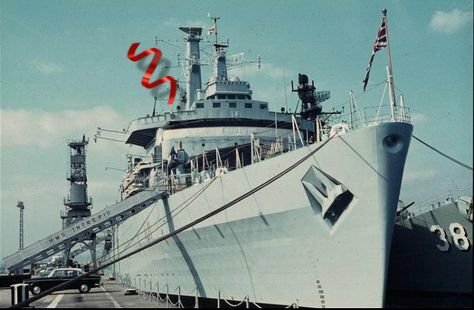 Real Royal Navy history. 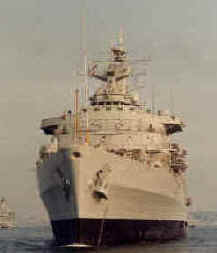 The Ship appeared in 007 film The Spy Who Loved Me. Special forces based on Fearless. 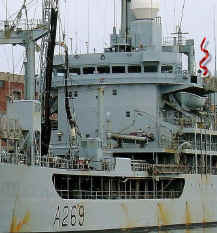 (sister ship to HMS Intrepid) Now dismantled at Van Heyghen breakers in Ghent. 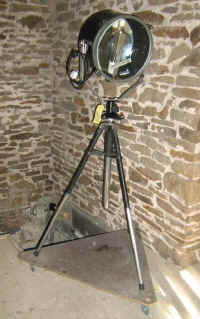 complete with a De Vere industrial tripod & including a Konig soft wheel dolly with brakes. Standing 6'.6" in picture extra 2ft available. ( I have a copy of the surrender ) Original external condition. 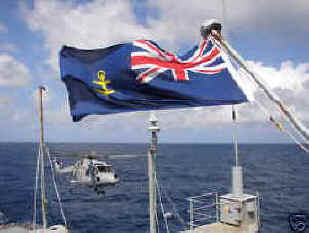 091 Above Ex Falklands HMS Intrepid. 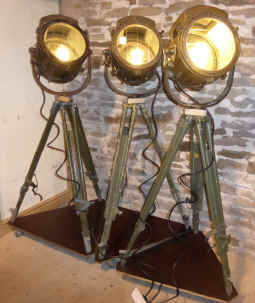 Delta deck /cargo lights. 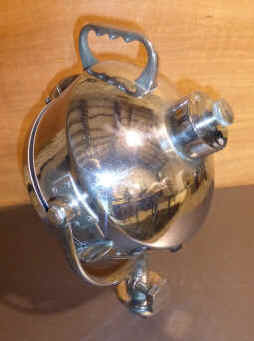 Heavy cast alloy with stainless steel fittings. 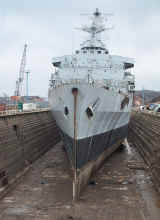 See picture of ship in the Graving dock now recycled. 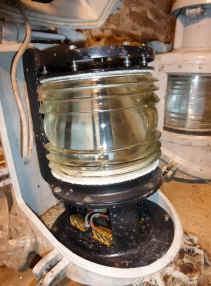 Note :- Glass of this thickness is ground to shape and expensive hence refurbished by dock yard . 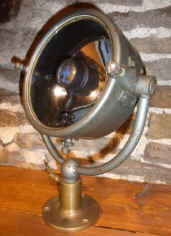 038 Below Veteran / Vintage CAV Antique Brass searchlights 12", parabolic glass mirror, Adjustable focus. 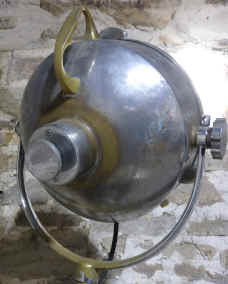 240 volt BC modern 70 Watt halogen bulb with dimmer sockets. 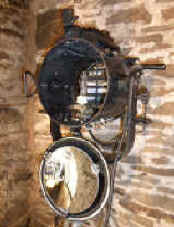 As used on early fire appliance's. 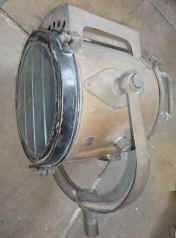 pic right with dimmer on. 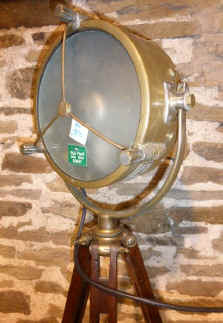 Looking for cradles / supports brass or steel . 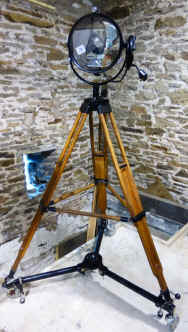 I have a few of spare original tripods some fixed antique wooden with brass fittings & alloy types. 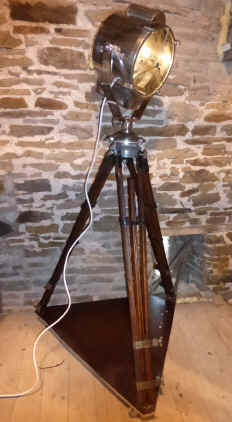 FROM around £40 for one "speaker tripod" Can be as much as £750 for the early very rare ex WW1 hand crank movie types. Note* The price may include engineering of parts already carried out plus international shipping and import taxes . 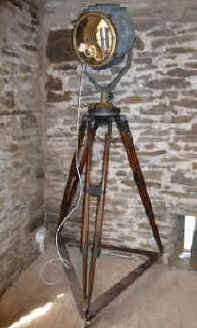 144 Above 2 left Surveyors tripod 5' 3" fully extended. 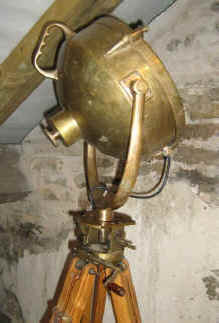 Ready for light with cradle spigot. 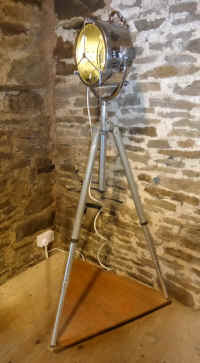 145 Above 2 middle Surveyors tripod 6' 0" fully extended .Ex Military rare model . Please ask if not sure.